Though it’s difficult to identify the specific detail that triggered the “Paul is dead” hysteria, Abbey Road contributed several new “clues” to the story. 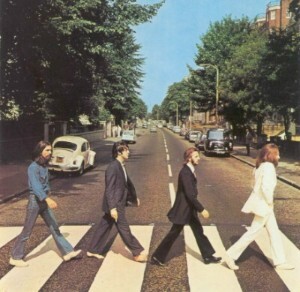 The cover, which shows a photograph of the Beatles walking in step across the street away from Abbey Road Studios, resembles a funeral procession. Leading the procession is John w earing white, symbolizing the clergy. Ringo, dressed in black, is a pallbearer or an the undertaker. George, dressed in work clothes, is the gravedigger. Paul, the corpse, is out of step with the other Beatles, leading with his right foot instead of with his left. Also, Paul’s eyes are closed and he is barefoot. Asserting that because people in many areas of the world are buried barefoot, Paul McCartney Dead: The Great Hoax stated that this was “a strong death symbol.” Also, Paul is smoking a cigarette, also known as a “coffin nail“. He is holding the cigarette in his right hand, even though the real Paul McCartney was left handed. Behind the Beatles on the left side of the street is a Volkswagen Beetle with a li cense plate reading “28IF”, suggesting the Paul would have been 28 if he were still alive. Actually Paul would have been 27 when Abbey Road was released. For those who thought that this was just too tantalizing to let pass, Paul Is Dead: The Great Hoax explained, “To the believer, 28 IF does symbolically state Paul’s age—since people (especially in the Near East where Paul learned mysticism) believe we are all one year old at birth (counting the nine months of pregnancy). 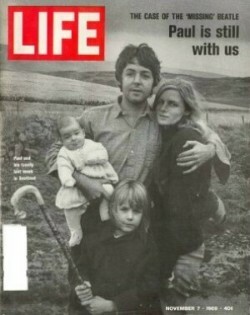 True, in this light, Paul would have been 28 IF he had lived!.” (Emphasis in original) The first three letters on the license place, “LMW,” has been interpreted as “Linda McCartney Weeps”. One pr oblem with this interpretation, however, is that Paul had yet to meet Linda Eastman in 1966 when Paul’s fatal accident supposedly occurred. 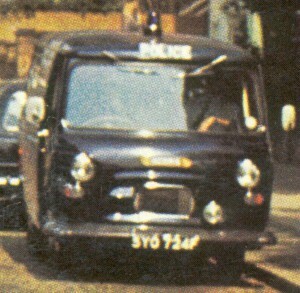 A police van was parked on the opposite side of the street in the Abbey Road cover photo. Joel Glazier, author of “Paul Is Dead… Miss Him, Miss Him” in the fanzine Strawberry Fields Forever #51 (1978), asserted that the police who came to the scene of Paul’s fatal accident in 1966 were paid off to maintain secrecy. To Joel Glazier the police van parked in the background is a reference to this. 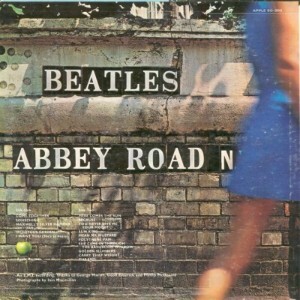 The back cover, which shows a young woman walking by a wall marked with an Abbey Road street sign, was also scrutinized for “Paul is dead” clues, and the images on the back cover have given rise to some of the strangest clues. Embedded in the concrete are a set of tiles spelling out “Beatles” and the “S” at the end of “Beatles” has a crack running through it. In The Walrus Was Paul: The Great Beatle Death Clues of 1969 , R. Gary Patterson suggests that this is an allusion to literary “supernatural characters who assumed any shapes desired. This shape appeared perfect at first glance, but upon closer examination, a slight deformity was evident.” He cited the character of Geraldine from “Christabel” by Samuel Taylor Coleridge and “Lamia” by John Keats—easily the most literary (and far-fetched) of the “Paul is dead” clues. To the left of the tiles spelling out “Beatles” are eight dots, which when connected form the numeral “3”, so the back cover actually reads “3 Beatles”. In 1970 Joel Glazier visited the wall where this photo was taken and he counted 13 dots. His conclusion was that the Beatles had intentionally cropped the picture to reveal the number of remaining Beatles. Also, he noted that to the right of the tiles is a very odd shadow that looks like a skull. R. Gary Patterson reports that a number of conspiracy theorists thought that the woman walking by was Jane Asher, Paul’s girlfriend at the time of his fatal accident.Conspiracy theorists believe that she must have been aware of Paul’s death and replacement by a look-alike, so she must have been paid to keep quiet about the whole matter. Joel Glazier, however, asserted that the woman’s image was included on the back cover because it contained a visual reference to Paul McCartney. He suggested that if you look at the elbow of the woman in the photo from a distance, you can see Paul McCartney’s profile, with his nose in the upper right hand corner of the picture and the woman’s elbow forming his mouth. Those looking for references to Paul’s death listened closely to the lyrics of the songs on Abbey Road. As R. Gary Patterson points out, the tone of “Come Together” suggests that “an underlying tragedy was hidden beneath the lyrics,” and the cryptic imagery of the song lends itself to imaginative interpretation. The opening line of the song “Here come old flattop” might refer to the injuries to the head Paul sustained in his fatal crash. “He wear no shoeshine” may refer to the barefoot Paul in the cover photo for the LP. “Got to be good looking ’cause he’s so hard to see” may refer to the absence of the “cute Beatle.” “Got to be a joker/He just do what he please” might refer to the “great hoax,” Paul’s replacement by a lookalike. And the line “One and one and one is three” might mean that there are now three Beatles instead of four. The medley that dominates side 2 of the LP offered plenty of fodder for conspiracy theorists, as well. The interlocking set of eight songs from “You Never Give Me Your Money” to “The End” may not have been thematically related but the song fragments fit together well. This form was fairly novel in 1969 and the reputation of this piece has grown over the years. Rolling Stone calls it “the matured Beatles at their best: playful, gentle, acerbic, haunting and bonded by the music.” Inevitable, then, that conspiracy theorists would examine this piece closely. Joel Glazier pointed out that the “Sun King” was the French monarch Louis XIV. In Part III of The Vicomte de Bragelonne or Ten Years Later by Alexander Dumas, “The Man in the Iron Mask” is Louis XIV’s twin brother who, through an elaborate plot, comes to replace the “Sun King”. To Glazier this reference supported the story that Paul had been replaced by a lookalike. Also, Andru Reeve, author of Turn Me On, Dead Man: The Beatles and the “Paul Is Dead” Hoax , points out that the songs in the medley contain a number of references to death. “You Never Give Me Your Money” contains the line “All good children go to Heaven,” “Golden Slumbers” is “the Big Sleep—death,” and the medley concludes with “The End.” He also mentions that “Carry That Weight” could be interpreted as a pallbearer’s task (which is how this song was used in the Bee Gees/Peter Frampton musical adaptation of Sgt. Pepper’s Lonely Hearts Club Band ), as well as the heavy burden on the remaining Beatles after Paul’s death. “It is all bloody stupid,” complained Paul McCartney when he was interviewed by Life magazine in the fall of 1969. “On Abbey Road we were wearing our ordinary clothes. I was walking barefoot because it was a hot day. The Volkswagen just happened to be parked there.” Clearly Paul McCartney was bothered by such strange interpretations of the Abbey Road cover and he has made references to it at various points over the years. In 1993 he released the album Paul Is Live, choosing the title not only because it was a live album, but also as a counter to the “Paul is dead” story. 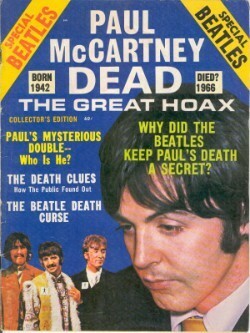 In the cover photo McCartney consciously addressed the “Paul is dead” mythology that had emerged surrounding the Abbey Road album cover. 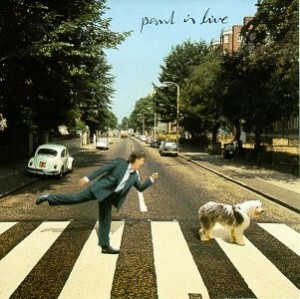 The cover shows an updated image of him crossing Abbey Road with his dog, Arrow, who was a descendent of Martha, immortalized in the song “Martha My Dear” on the White Album. Paul is balancing on his left foot (rather than leading with his right foot) and holding the dog’s leash in his left hand. Paul’s eyes are open and he’s wearing shoes. Gone is the police van but the the white Volkswagen Beetle remains. 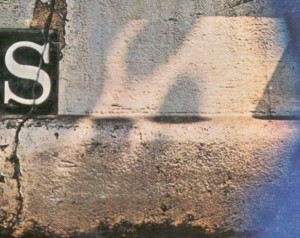 Close inspection reveals that the license plate has been changed to read “51 IS”, as Paul was 51 when this album was released in 1993. In 2009 Paul McCartney was a guest on the Late Show with David Letterman. Dave asked him about the “Paul is dead” hysteria, and McCartney pointed to the Abbey Road cover as the trigger for the rumors. What happened was we did a cover for a record called Abbey Road and we–[applause] see, even the cover gets applause! The idea was to walk across the crossing and I showed up that day with sandals–flip flops–and so, it was so hot that I kicked them off and walked across barefooted. So this started some rumor that because he was barefooted, he’s dead. I couldn’t see the connection myself…. It was American DJs so you guys are to blame. Not you personally. The thing is, you know, I just laughed it off but it was a little bit strange because people did start looking at me like… is it him or a very good double? It’s interesting to consider why Abbey Road was the album that triggered the “Paul is dead” hysteria. Perhaps the growing awareness that all was not well with the Beatles contributed to this phenomenon, but this does not completely explain why the “Paul is dead” story took on a life of its own at this particular time. In his book Watch the Skies! A Chronicle of the Flying Saucer Myth , Curtis Peebles suggests that the incident that took place in Roswell, New Mexico, in 1947 did not have much of an impact on mainstream culture until decades later because the mythology about UFOs was not yet in place to support the story. Only after key elements of UFO mythology had been established did the story spread beyond a small group of conspiracy theorists. Similarly, the “Paul is dead” mythology was not fully in place until 1969 when college students organized the “clues” into a narrative. I would point in particular to Fred LaBour, who created key elements of the story that would later be repeated as true, such as the identity of Paul’s double, WIlliam Campbell. Fred LaBour had listened to Russ Gibb’s radio show on October 12, 1969, before writing a review of Abbey Road for his college newspaper. He structured the review, which appeared in the Michigan Daily two days later, as an obituary built around a number of the “Paul is dead” clues that he had either heard or invented to fill in the gaps. Once this narrative was in place, the “clues” took on new meaning and the story spread rapidly after that. Posted on June 19, 2013 June 25, 2013 by Dead Man	in Paul Is Dead. Tags: Abbey Road, Beatles, David Letterman, Fred LaBour, Paul is dead, Paul McCartney, Russ Gibb.